10 steps to a successful content marketing campaign. Page 29. How to write killer content-rich white papers. Page 4. Where to get great content you can use in your marketing for free. Page 11. An easy way to increase the perceived value of your content. Page 22. 6 ways to create a great title for your lead magnets. Page 32. How to write and designing a high-conversion landing page for content offers. Page 36. 10 secrets of selling to techies. Page 1. Free Bonus: Infographic: Marketing Rules of Thumb. Page 39. 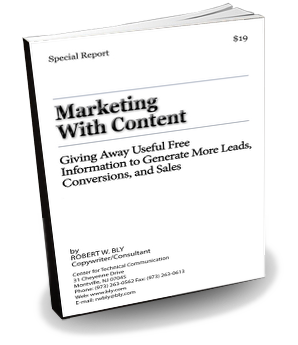 * Please send me: FREE copy of your special report Marketing with Content.